Beast of the Bering Sea airs Novermber 9th on SyFy, and Stonados will finally air November 23rd! Beast of the Bering Sea you will probably recall us mentioning as Bering Sea Beast. Cassie Scerbo and Jonathan Lipnicki play sibling prospectors who disturb a colony of amphibious sea vampires in an underwater cave. Then people die. Asylum is the creative team. 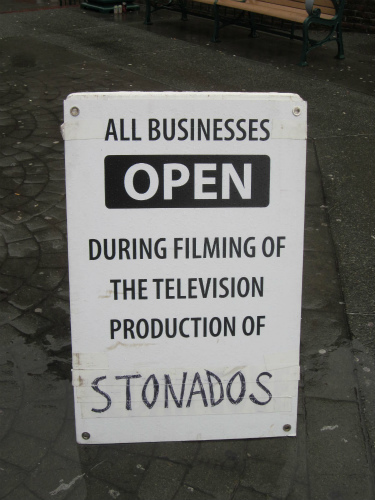 Those of you who pay attention to what SyFy airs might recall that Stonados was once prepared to smash up the airwaves April 27, but was pulled at the last minute because it took place in Boston, which has suffered a terrorist bombing that week. Stonados was pushed back, but the scheduled reairing on June 27th didn’t take place, either. Despite Stonados appearing overseas, it has yet to be broadcast in America, but is back on SyFy’s schedule for November 23rd! Finally, we will see Stonados! SyFy – Thursday Flicks and Future Fun – Roswell, Robocroc, Bering Sea Beast, Last Halloween! The SyFy twitter page has been a bit active giving a few clues as to future features. Rise Of The Dinosaurs on May 11th will be the last Saturday show for a while, as Saturdays become the realm of SyFy original and imported tv series. Movies are moving to Thursday, the first of which scheduled is Axe Giant on June 13th, it’s the Paul Bunyan is a crazy killer flick that looked pretty fun. The next batch of Thursday flavor is on June 27th, which will give us a double-feature of Stonados (making a triumphant return after getting yanked due to the Boston bombings) and Independence Day-saster, which has an awesome name and we mentioned it long ago. 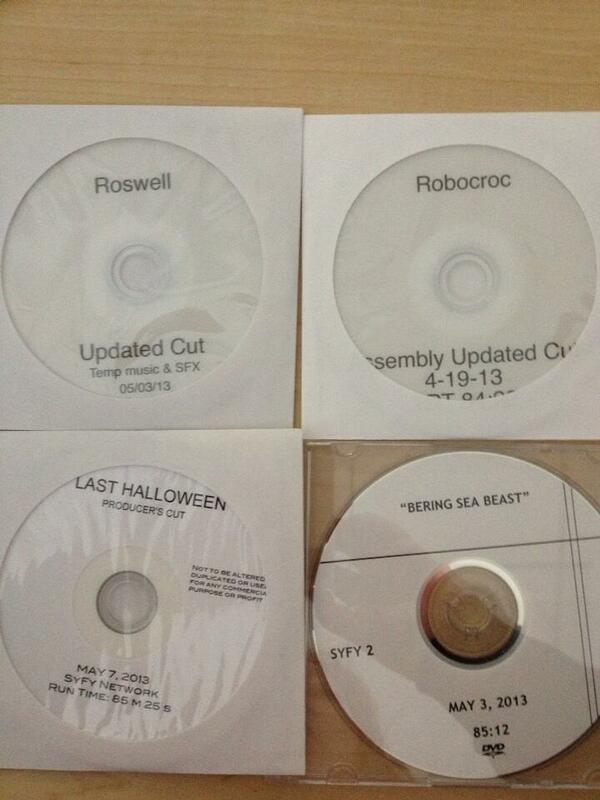 The twitter dropped an image of four screeners that just arrived: Robocroc, Roswell, Last Halloween, and Bering Sea Beast. A tradition as old as life itself. A tradition old as the demonic forces it represents. The story of a group of people unwilling to face the truth, and unable to reconcile the past. And one man who can. But is he even a man? When humans can’t put the past away. And another entity who simply does not want to. Starring Nathaniel Sylva, Vanessa Leigh, Michael Thurber, Tom Paolino, Olivia Larsen, and David Erin Wilson, and is directed by Christopher L. Ferreira. Bering Sea Beast has no imdb info, but I have found from twitter it stars Jonathan Lipnicki, Cassie Scerbo, Brandon Beemer, and Jaqueline Fleming, and is sort of a take on the realty TV series I never heard of called Bering Sea Gold. And it has Sea Vampires. Is Rise of the Dinosaurs SyFy's last Saturday Creature Flick for a long time? 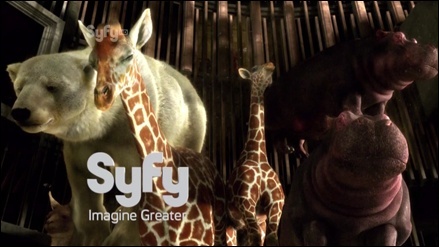 Because SyFy’s moving their movies to Thursday premieres for the summer! If you haven’t noticed, SyFy has gone loco and suddenly started to produce a bunch of actual science fiction shows and is attempting to become an actual network that follows its name and not just a place for edited movie reruns and wrestling. I, for one, support this endeavor, and whole-heartedly approve of SyFy’s attempt to bring a bunch of science fiction dramas to television. But, as fallout from this, one of the nights SyFy is setting up programming blocks will be Saturday. Thus, the movie premieres are getting moved to Thursdays! Long time watchers of SyFy (back when it was SciFi Channel!) might remember that Thursday was once the day these new movies premiered (and even became a day they would randomly premiere one anyway after the move to Saturday!) so this isn’t so out of line. It’s just been a good long while. But before that happens, there will be a few more films popping up. First up is Stonados on April 27. It features tornadoes with rocks in them. May 11th features the premiere of Rise of the Dinosaurs, and there are no more movie premieres scheduled for the rest of May. The real mystery is Rise of the Dinosaurs. Because I can’t find a thing about it. Which means it’s probably something else renamed. But what? Asylum’s Age of the Dinosaurs? That doesn’t seem finished enough to be it. Jurassic Attack? It’s out in Europe, so maybe. A bootleg Ice Age sequel? Or it could be something else entirely. No one who knows is saying nothing! Those jerks!